How to copy or move file with progress? In old Win98 days, File copying progress notification was horrific. Even if you have a lot of data to copy, it always says – you have 5 more minutes to finish. 😀 Well, how to copy or move file with accurate progress? You can use the api – CopyFileEx() for copying data with progress and MoveFileEx() to move files with progress. Both are more or less similar in usage. In both cases, just call the apis by providing the callback function pointer. System will give callback notification for the progress. See the code snippet of CopyFileEx(). // Callback function for handling progress notification. // Calculate the percentage here. // Continue the file copy. It can also be stopped. CopyFIleEx() and MoveFileEx() are available only from Windows NT onwards. So don’t forget to add _WIN32_WINNT=0x0400 to project settings. how to set color for static control text in dialog? Colors convey meanings too. For instance, if something is written in red – that means something to be cautious. If its in green, its treated as safe. Well, usually in window dialogs, the static control texts are black in color. Is it possible to color them to convey more meaning? Yes! You have to handle WM_CTLCOLOR message. For each control, this message will be triggered and you’re free to do modification on your control. Have a look at the code snippet in MFC framework. // Call base class version at first. Or else it will override your changes. // Check whether which static label its. // Set color as red. Always call CDialog::OnCtlColor() at first. Or else it will override your modifications. How to check whether the window handle is valid? Since communication by messages are so easy, windows used to communicate with each other by using messages. For instance, if simple data blocks are to be transfered – WM_COPYDATA can be used. For all those instances the window should be alive. But how to know whether the current window handle is valid or whether it points to a dead window? You can call the api – IsWindow() by passing window handle. If the handle points to a live window, then the function returns true else false. Have a look at the code snippet. // The handle to be tested. // Check whether the window is still there. While digging for the api, i found an interesting info. What about window handle re-cycling? For instance you have a window handle and you’re going to check that window by calling IsWindow() function. But in between that the real window is closed and a new window is created. Whether the window handler will be allocated to the new window? Microsoft Visual Studio 2008 Service Pack 1 Released! Visual Studio 2008 Service Pack 1 is released! Enjoy the new Service Pack!!! 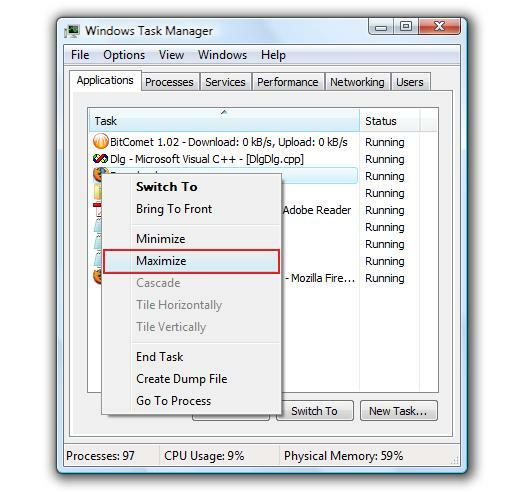 How to disable maximizing the dialog from Task manager? Its not mandatory for every windows citizen to have maximize button. 😀 For instance, Windows calculator. But do you know that via taskmgr we could maximize any dialogs? Even you can maximize the dialog which doesn’t have maximize style. Its a master piece of QA team to make the dialog look weired. Well how to prevent it? You can do it by handling – WM_GETMINMAXINFO message. Before resizing, this message is fired to the dialog to get the minimum and maximum window dimensions. Since, we don’t need to change our dimensions, we have to set the max dimensions as current window dimension. Have a look at the code snippet. // Set the maximum size. Used while maximizing. // Set the x,y position after maximized. There is one small known issue – if we maximize via taskmgr, the window remains same, but the title bar will be painted like maximized. How to hide file programmatically? Hidden files are very basic and primitive mode of protection. If your file is set as hidden, it won’t get listed to normal user, unless he explicitly enabled – “Show hidden files”. Well, how to make a file really hidden? You can use the api – SetFileAttributes(). Pass FILE_ATTRIBUTE_HIDDEN as attribute and you’re file will be hidden. Have a look at the code snippet. // The file, which is to be hidden. How to handle F1 or help in application? Help is inevitable part of every windows application. The first function key – F1 itself is assigned as help in every application. Well, how to handle the user’s “Mayday” call in application? Basically you’ve to handle the WM_HELP message. When you press F1 the WM_HELP message will be posted to your window. To handle this via MFC, Add ON_WM_HELPINFO() to message map and implement OnHelpInfo() in your dialog. Have a look at the following code snippet. // Add ON_WM_HELPINFO() to your message map. // Add this function to your dialog. // Handle your help request here.